Welcome to FrankWealth.com: 10 Strange Rituals Astronaults Perform Before Traveling to Space! 10 Strange Rituals Astronaults Perform Before Traveling to Space! Astronauts are a highly disciplined, highly trained bunch. After a rigorous selection process and at least five years of intensive training, they know how to fly a spacecraft, fix a space station and use a space toilet. But even then, nothing is left to chance. The Russian Soyuz is currently the only spacecraft capable of carrying astronauts to the International Space Station (ISS), but getting on board involves a minefield of superstitions, procedures and etiquette. As I observed in Russian mission control recently, myths, legends and traditions have built up around launches ever since since Yuri Gagarin’s first orbit in April 1961. Not all of it makes sense. But when you are about to sit on top of 274 tonnes of explosive rocket fuel, you probably don’t want to push your luck by walking under any ladders. Baikonur in November. A piercing wind blows across the Kazakh Steppe lifting snow from the icy ground. The grey leaden sky blends into the grey of the airport runway. Icicles hang precariously from the broken guttering of the hangars. A small jet aircraft taxis to a halt and men smothered in thick fur-lined coats position steps at the doorway. Three figures descend onto the cracked concrete as piped music blasts from a Soviet-era sound system. Then a line of women – also dressed in coats, hats and gloves – start waving glittering gold-coloured pom-poms in the air. This is the traditional welcome that greets astronauts and cosmonauts arriving at Baikonur cosmodrome for their trip to space. Its origins are unclear but no flight is complete without a flurry of golden pom-poms. The most immediate, and debilitating, effect of leaving the planet is space sickness – a common complaint among even the fittest astronauts. With flights to the ISS now taking only six hours, and with dozens of complex course corrections to coordinate along the way, a vomiting crew is the last thing you need. One of the solutions devised by Russian space physiologists is to attempt to deliberately disorientate the astronauts before they launch. A few hours before flight, each crew member is spun on swivel chairs and tilted upside down on special beds to prepare them for the zero-G experience. There is some debate in the space community about whether any of this is effective. However, as long as you have a sick bag handy, it is at least something you can try at home. One of the most poignant memorials to spaceflight is an avenue of trees at Baikonur. Planted over the past 50 years, each tree represents a mission and the cosmonauts who flew it. They not only commemorate those who made it into space, they also provide a living memorial to those who didn’t make it back. Today, it is traditional for each crew member to plant his or her own sapling, a task that is relatively straightforward in the balmy Kazakh spring but less so in the bitter winter when the ground is rock hard. What do you do the night before a launch? Watch a movie. But not just any movie. According to IMDb, The White Sun of the Desert is a “Russian twist on the American western”. It’s a Russian classic apparently, but as I’ve never seen it, I can’t really give an opinion. However, every astronaut that has flown from Baikonur since the early 1970s has ritually watched this film before launch. In Russia everything needs to be signed for and that includes your rocket. It is traditional for the crew to sign-off their spacecraft to indicate their approval that it is fit for flight. Given that they have not been involved in its construction, it is not clear what would happen if it turned out not to be. 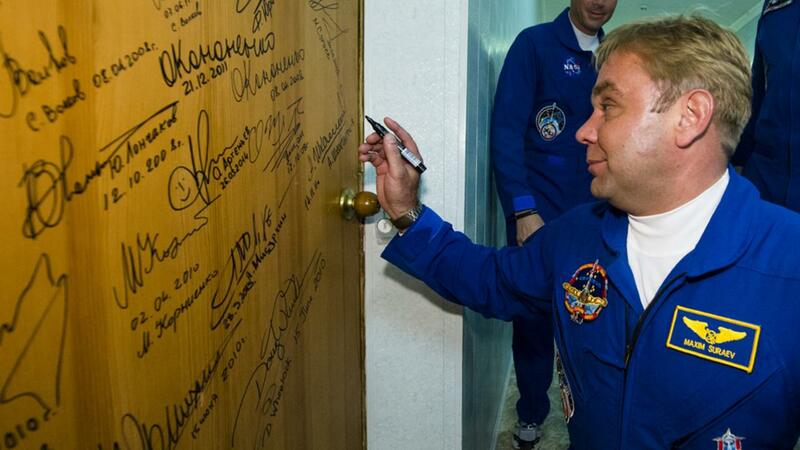 The crew also sign a wall in the museum at Baikonur and the door of their bedroom at Baikonur after their last night on Earth. Like the trees, these serve as a testament to the longevity of the Soviet and Russian space programmes. On their return, the crew also very often sign the charred outer casing of their space capsule. It is considered bad luck for the crew to watch their rocket being rolled out to the launch pad, so they are kept away. 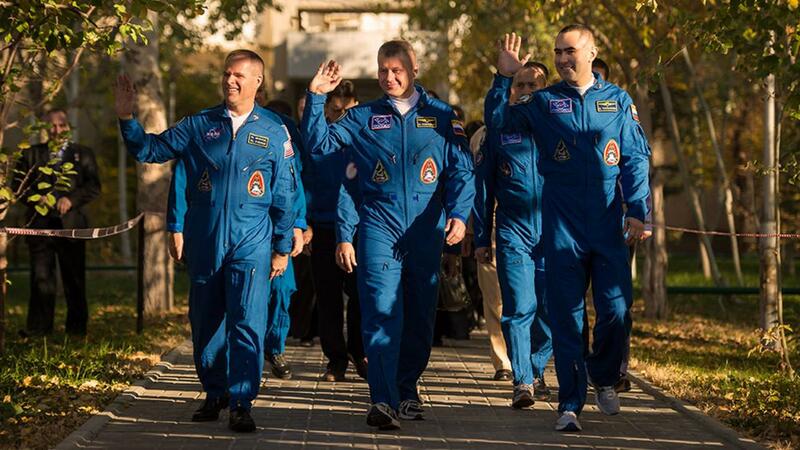 But, just as the crew have traditions to maintain, so do the engineers, support staff and astronaut families. The Soyuz is moved from its hangar on a railway line, pulled along agonisingly slowly over several hours by a diesel locomotive. As the train inches towards the pad, spectators place coins on the track to be flattened by the wheels. This is believed to bring luck to the mission and, so far, has not led to any derailments or injuries. 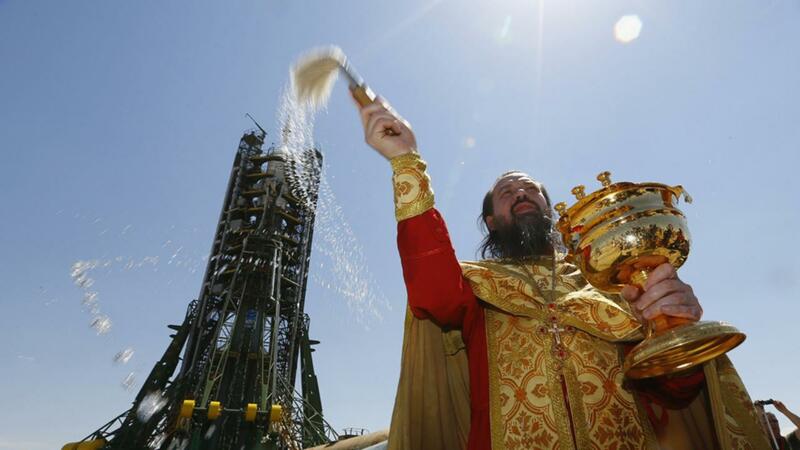 Incidentally, once the rocket has reached the launchpad, it is blessed by a priest. Watch the capsule interior video during any Russian rocket launch and you will notice a cuddly toy hanging from the instrument panel. 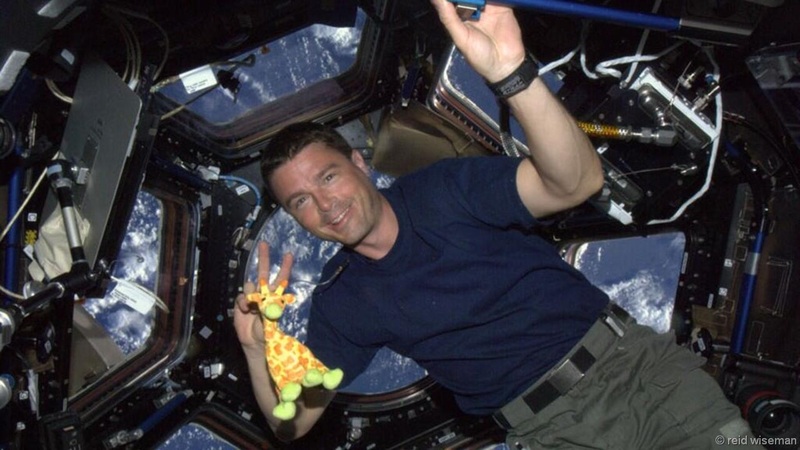 For the most recent launch of Expedition 40 to the ISS, the toy in question was a cute toy giraffe belonging to the daughter of Nasa astronaut, Reid Wiseman. Not only do these toys serve as mascots for the mission, they also serve a serious purpose. When the rockets have finished burning and the Soyuz reaches orbit, the toys will float free to indicate to the crew that they are now in weightlessness. It’s the equivalent of using a canary in a mine to monitor air quality although, in this case, any toy animal is acceptable. In the entire history of Soviet and Russian spaceflight – as far as we know – only four cosmonauts have lost their lives during a mission: the Soyuz 1 pilot, Vladimir Komarov, in 1967 and the three man crew of Soyuz 11 in 1971. No other nation has such a remarkable safety record and the Russians are keen to maintain it. The logic of superstition follows that if something was done a particular way one mission and it was successful, then it should be kept that way for the next. Why risk change? One of these traditions can be traced back to the very first cosmonaut, Yuri Gagarin. 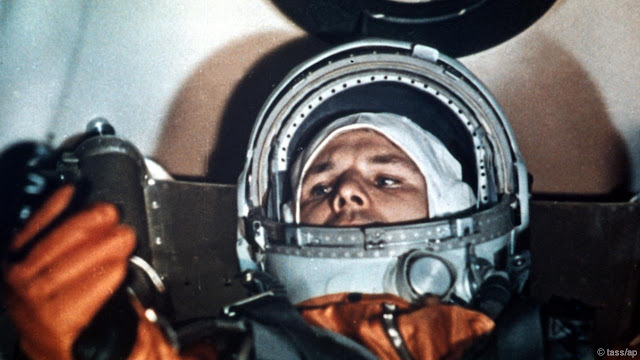 In April 1961, Gagarin was strapped into his capsule on the launch pad; the hatch had been closed, checks had been completed and he was ready to fly. With nothing to do but stare at the instrument panel a few centrimetres in front of his face, he requested that mission control play some music over the intercom. They slapped on a record of Russian love songs. Exactly the same thing happens today, although the music selection can be broader and is selected by the entire international crew. For every Russian love song there is a bound to be at least one play of “Rocket Man” or German techno. You can read more about music in space here. 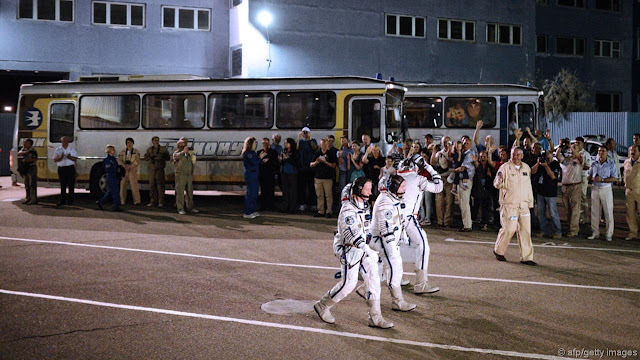 Probably the most extraordinary tradition of the Russian space programme also goes back to Gagarin. Apparently (because no-one knows for sure), on his way to the launch pad Gagarin asked the bus to stop so he could relieve himself. He got out and urinated against the back right-hand tyre. In 1961 this made complete sense, the world’s first spaceman did not want globules of urine floating around his capsule. It makes less sense today when astronauts wear nappies and are strapped into their three layer spacesuits, which are then sealed and leak tested before they get on the bus. Nevertheless, male astronauts are still expected to leave their bus, unzip their suits and urinate on the back right hand tyre. Suit technicians then have to redo the palaver of zipping them all up again. Female astronauts have been known to bring vials of their urine to splash on the wheel. Every space traveller knows that the most massively useful thing to have is a towel. Thanks to the late Douglas Adams’ hugely influential Hitchhiker’s Guide to the Galaxy, alongside tens of thousands of others around the globe, some astronauts now commemorate Towel Day on 25 May. A new space tradition that would surely make Yuri Gagarin proud.